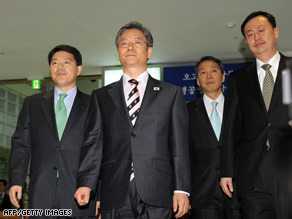 Government officials from South Korea arrived in the North on Tuesday for the first inter-Korean talks in more than a year. The details surrounding the session were sketchy. The exact nature of the talks, their agenda and location were to be determined after the delegation’s arrival, a Unification Ministry official said. The talks come amid heightened political tensions on the peninsula, after the recent test launch of a long-range rocket by North Korea. The launch was quickly condemned by the U.N. Security Council as a violation of a resolution banning ballistic missile testing. North Korea subsequently expelled U.S. nuclear experts and U.N. nuclear inspectors, ended six-party talks and said it will reactivate all its nuclear facilities. North Korea proposed the talks last week — the first talks since South Korean President Lee Myung-bak took office in February last year. Rapprochement talks between the two sides have hit a wall since the conservative Lee took office with a tougher stance toward the North than his liberal predecessor Roh Moo-Hyun. The two countries have technically remained in conflict since the Korean War ended in 1953, although relations have warmed somewhat in the past few years. The Korean conflict ended in a truce, but no formal peace treaty was ever signed. The six-party talks — involving China, Japan, North Korea, Russia, South Korea and the United States — are aimed at disarming the North of nuclear weapons.